this was so so soft that I'm crying 😭💛the illustrations are incredibly gorgeous and every page is an absolute heartfelt work of art. How do you even make a picture so quietly adorable and sweet that you feel things just looking at it? it's magic, truly. Dragons who grow flowers that you turn into tea is just about the cutest premise either. But this was also basically found-family, where this group of quiet and loving adventurers want to keep old arts alive (the slow process and art of tea making or being a blacksmith of swords). And just the sweetest ever diversity, with the characters being black and brown, in a wheelchair or with cognitive disabilities, or a bit of goblin' blood or hooves or horns. This is a queer delight, ok. I just...my heart is so full. 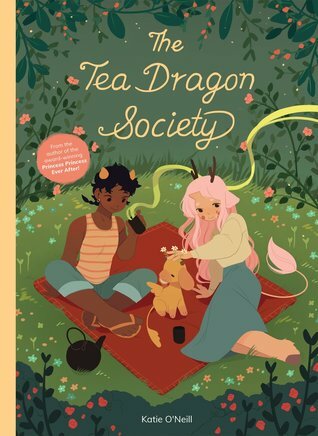 Sign into Goodreads to see if any of your friends have read The Tea Dragon Society. So I have considered buying this before but this review made me look at again on amazon and apparently there is a board game based on it!! So cute!! the illustrations are so adorable! !